On the street outside my window is what I have come to think of as the drinking bench. 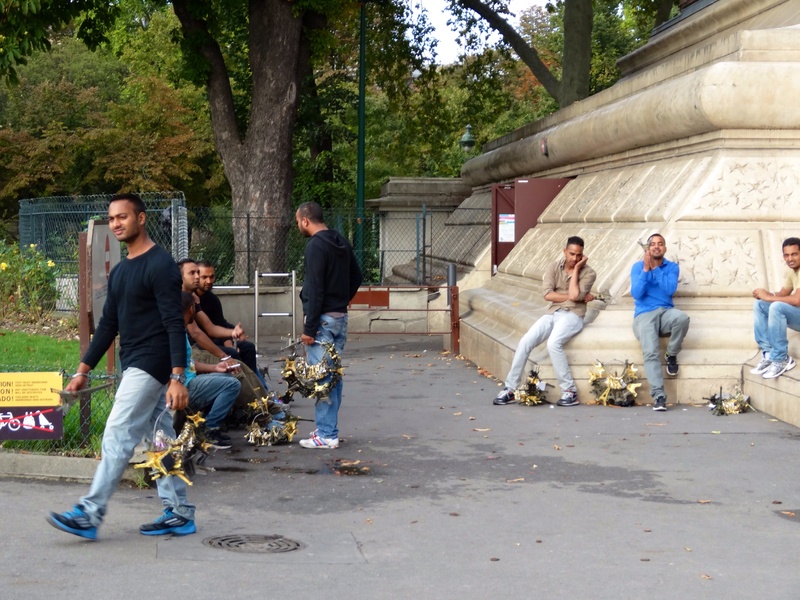 Everyday there is a group of men who sit and visit and drink wine. 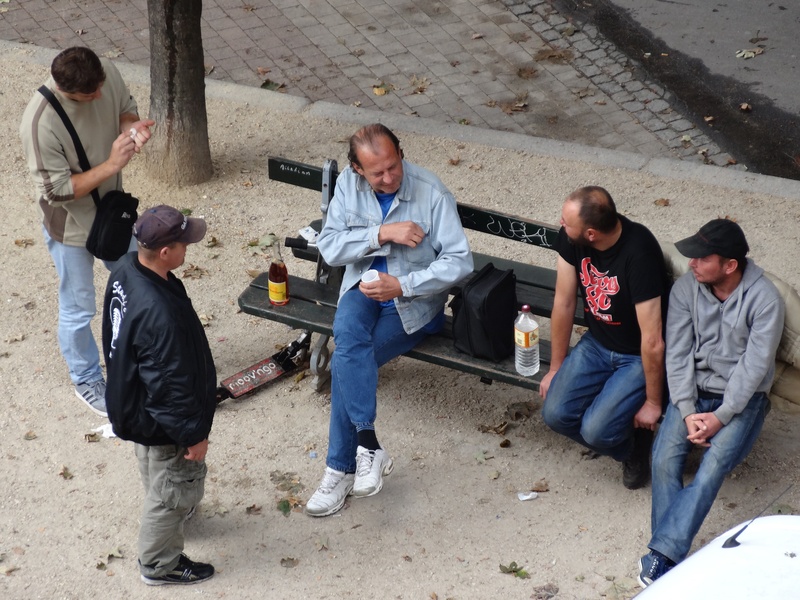 Although drinking on the street and in parks is not allowed everyone seems to do it. 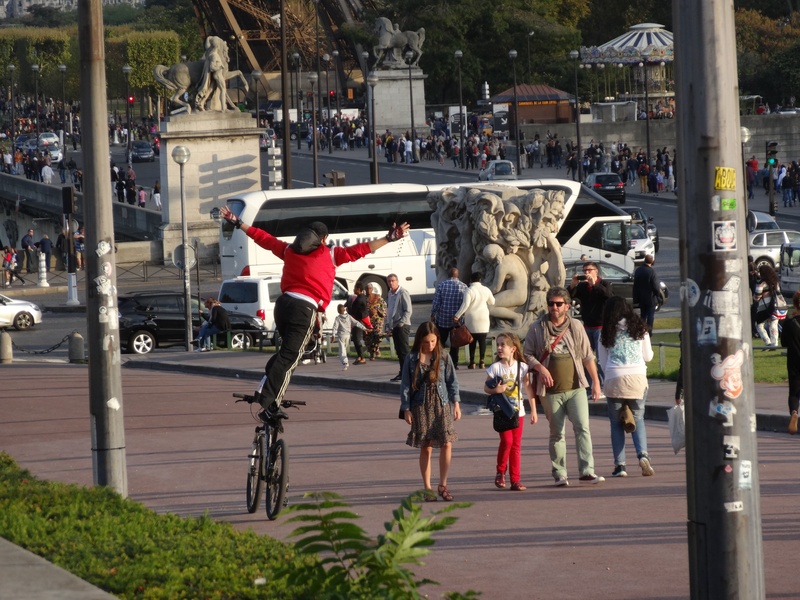 Yesterday in front of Sacre Coeur there were even people selling bottles of beer to the tourists! 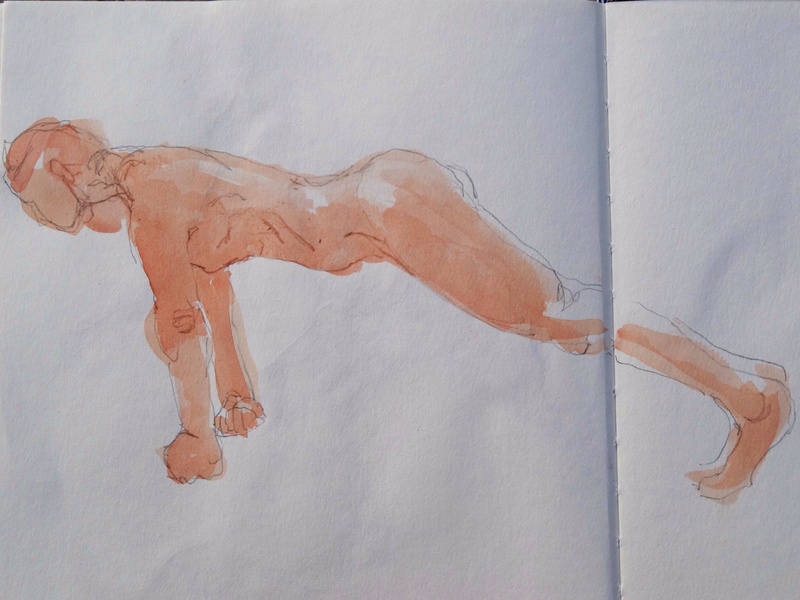 I went to a life drawing session at an artist’s atelier near the Eiffel Tower todayAnd the male model was excellent. He held some very difficult poses. 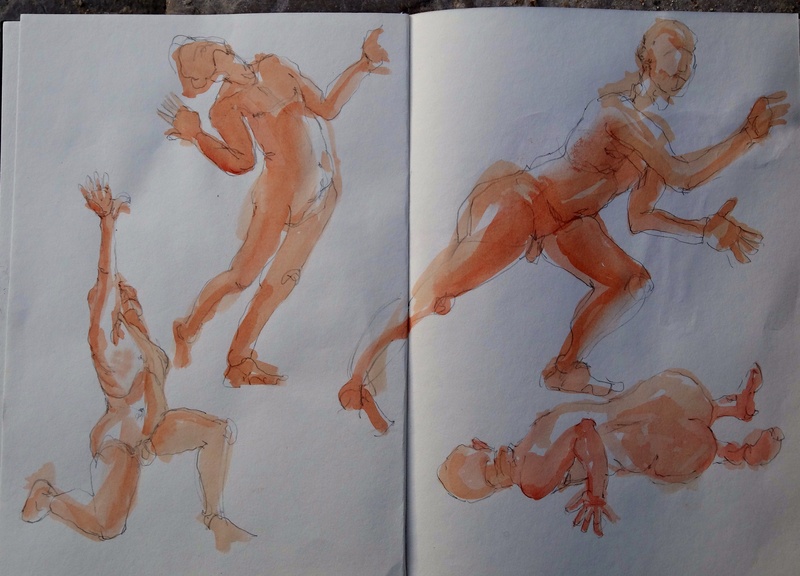 I have been playing with watercolour gestures, not always successfully, but I think it has promise so I will persevere. It is always difficult to try new things, it feels awkward and clumsy at first. Even if it isn’t something I decide to continue doing, it still adds to my knowledge and understanding. It is very easy to keep doing what I know works, instead of stepping into new territory, but I know I need to push myself in order to keep learning and improving. 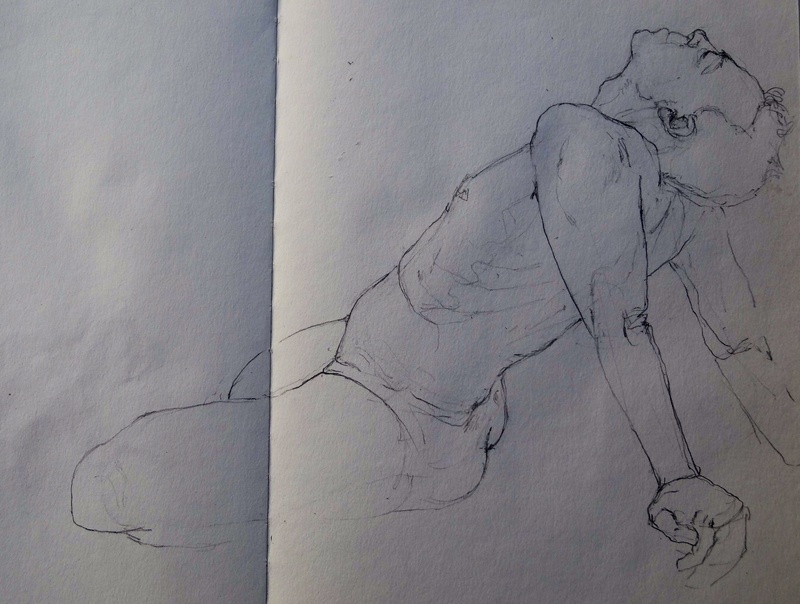 These are five minute poses, not many models would even attempt the one above. 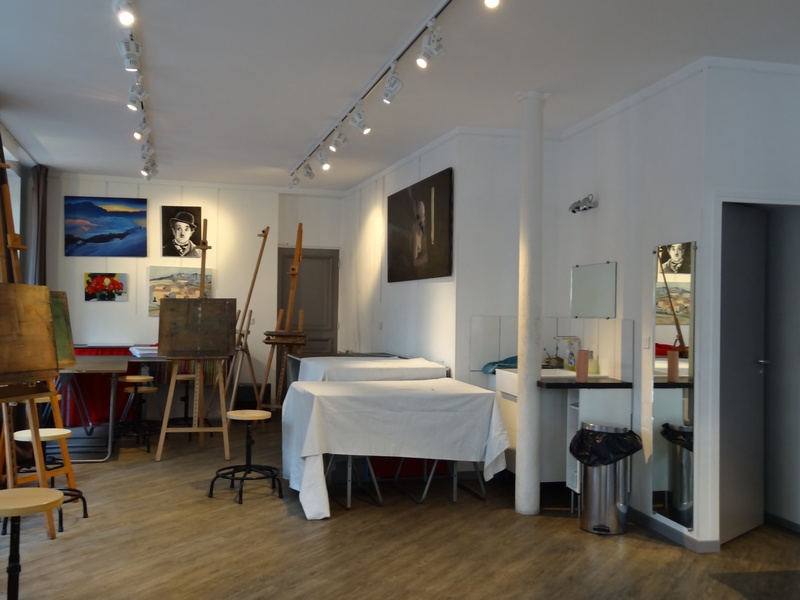 Here is a photo of the studio. Nothing too fancy, but Claire provided tea which was much appreciated. She was instructing a class, and I was allowed to come and do my own thing. The students were quite interested in what I was doing and gave me some nice compliments. 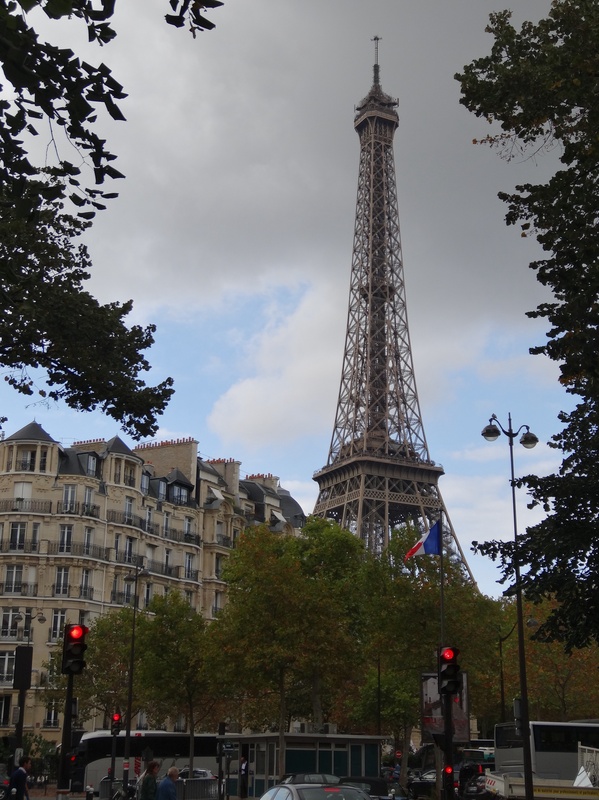 I decided to walk over to the Eiffel Tower, about a six block walk, and soon I could see it towering above the near by buildings. It is difficult to comprehend just how big this structure is. Soon I am right underneath, looking up. It is a special weekend, les Journées du Patrimoine, with lots of buildings open to the public and events taking place all over the city. 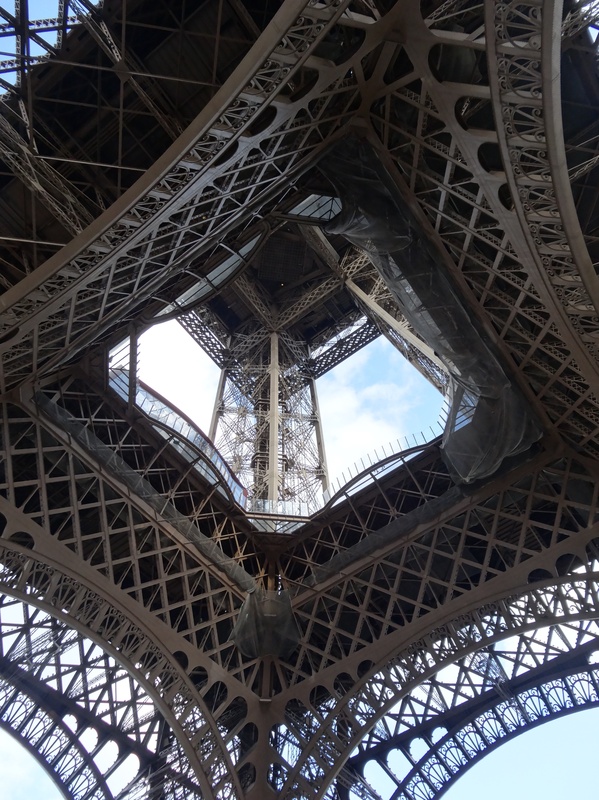 It is very busy here today, the line ups for the elevators stretch right across the plaza beneath the Eiffel Tower. There is an electronic sign flashing that says that the platforms are at maximum capacity and there is up to a 45 minute wait, and that is after waiting in that big line to get tickets! Good thing I had no intention of going up today. When we were here several years ago we were surprised to see military guards, somehow not so surprising today. 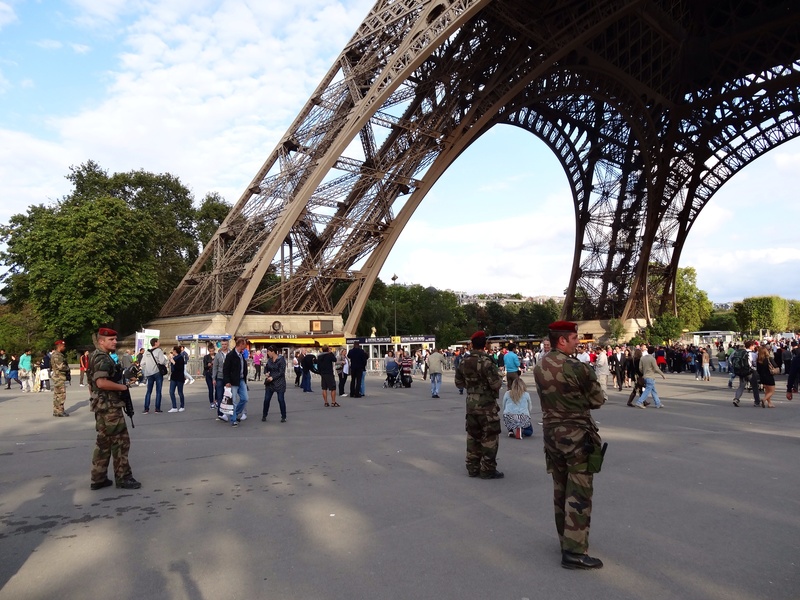 I have actually seen armed guards in several places, including the Gare de l’Est. Interestingly, neither the police nor the military seem to do much to deter street vendors, who can be quite insistent, I discovered that a quick shake of the head and not making eye contact seems to do the trick. This bunch is waiting for the elevator to come down from the Eiffel Tower, they then follow the people who get off, trying to convince them to buy an Eiffel tower of their very own. I watched this guy operate for a few minutes, and saw a man lose a hundred Euro bill! 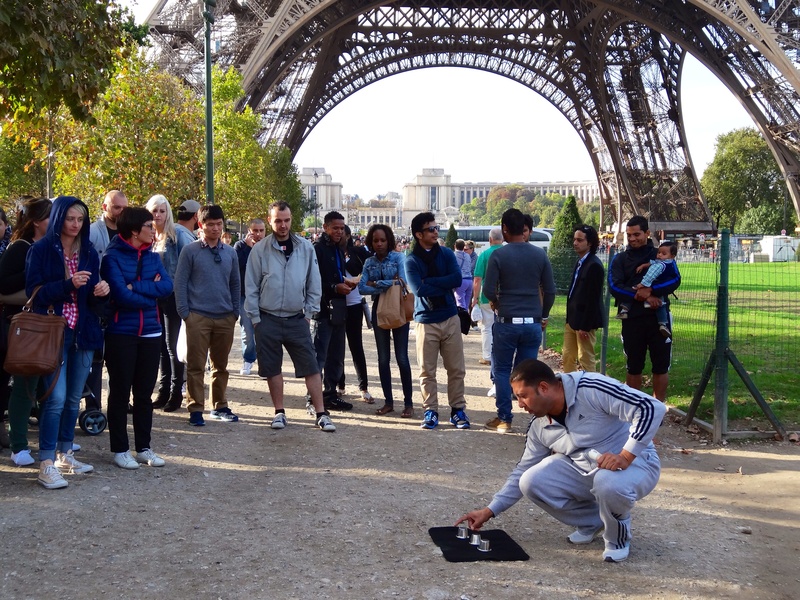 He was so sure he knew where the little ball was, and was quite shocked that he didn’t double his money, like the woman before him, who managed to pick the right cup several times. I am pretty sure she was working with the fellow manning the cups. I am surprised that people still fall for this. 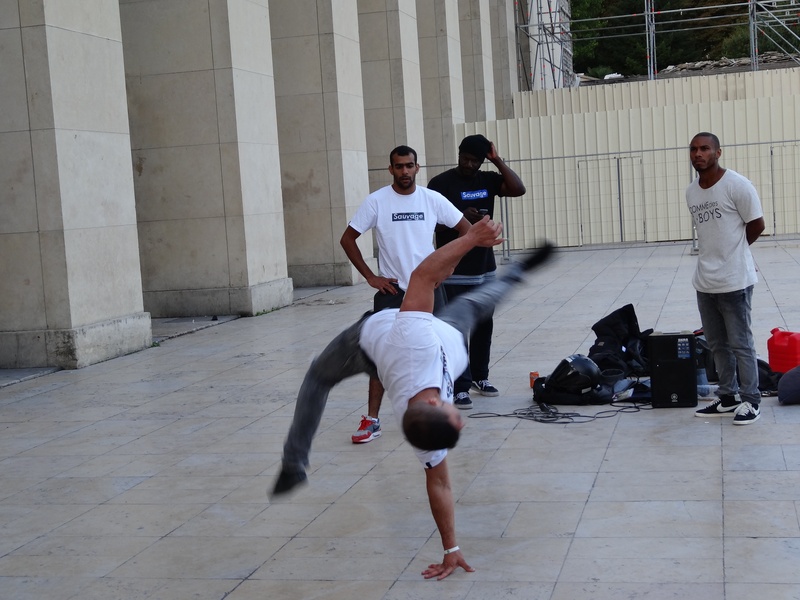 I head across the river towards the Metro, and stop to watch some pretty amazing break dancers. One of them invites a pretty young girl up on to the stage and is quite surprised when she pretty much matches him move for move! Turns out she is with the Astana Ballet, which is a ballet company from Kasakhstan. What a treat that was. I ended up sitting there for more than an hour, it was all so entertaining. One of the break dancers spoke to the audience in at least a dozen languages, including Japanese, Chinese, Korean, Spanish, German, Russian and more that I can’t remember. He seemed to know at least several sentences in each language and even answered in the different languages when the audience members responded! 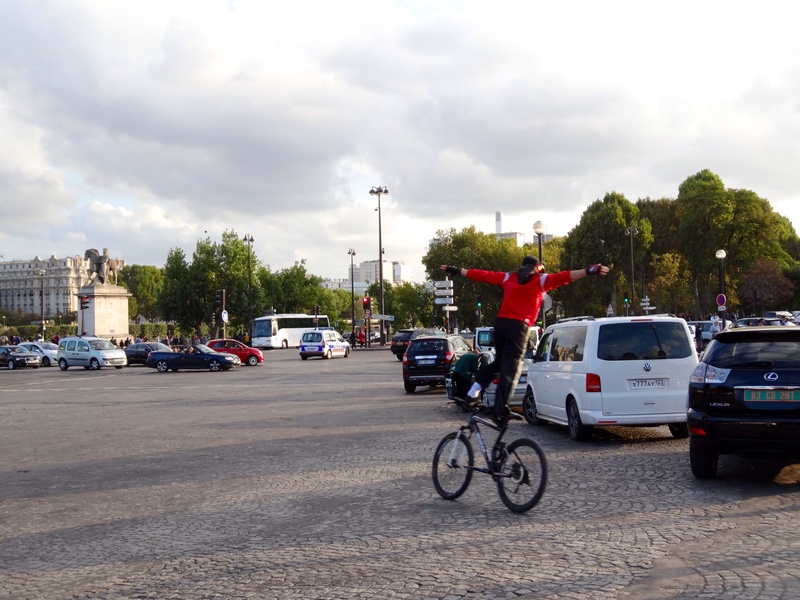 I also saw the craziest bicyclist ever. 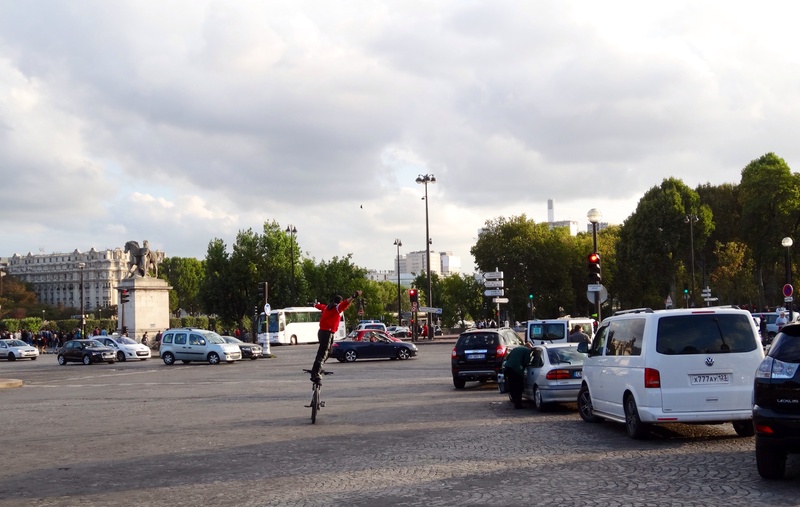 He came flying, down a pedestrian street standing up on his bike, which was scary enough, but he then continued onto the main road which was part of an intersection of six roads ! And he did this repeatedly! 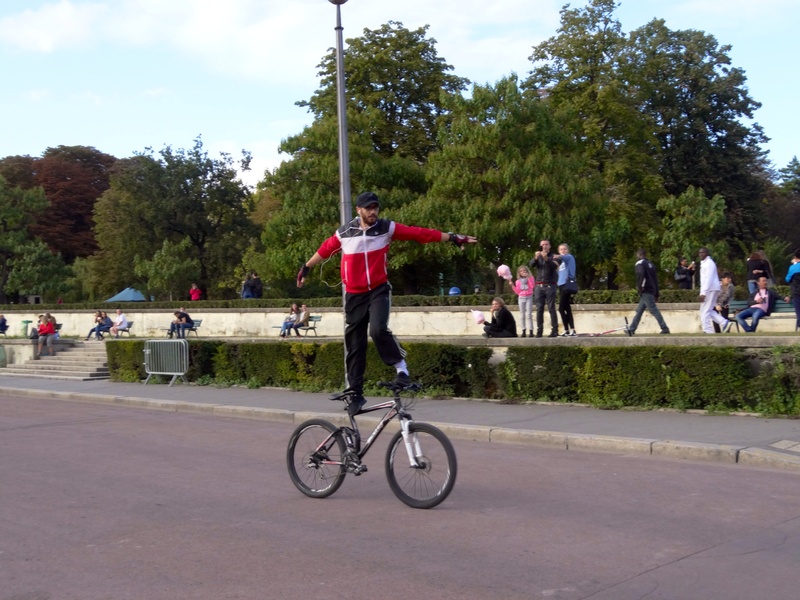 I stood in utter amazement and watched him perform this insane stunt at least a half dozen times. No idea what he is thinking. I am thinking he is lucky to still be alive! Time to get home. 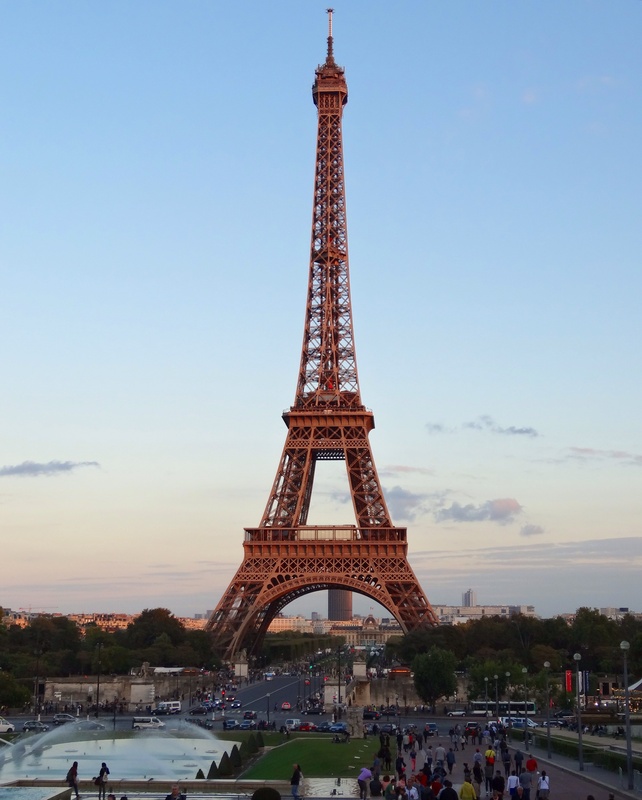 One last look back at the Eiffel tower in the setting sun and I head off to the Trocadéro Metro stop . The metro trains were very busy tonight, but a young lady and later a man get up to give me their seat. I guess having grey hair has some perks! It was almost 9:00 by the time I got home, the latest yet. I am getting braver.